There are things I like and don’t like about the Ap1. On one hand, I like having the 9k redline. On the other hand they are things that I can definitely improve on, such as looks which I addressed with my ap2 conversion . When I first got this car three years ago, I immediately noticed something was missing. There is no clock. How the heck am I suppose to go places without knowing what time it is!!!! 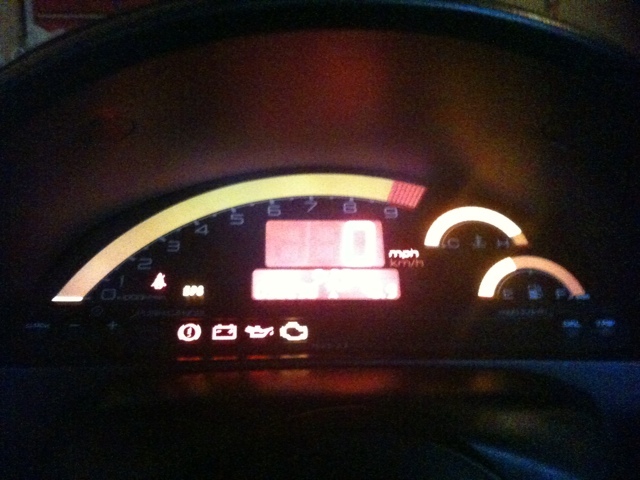 The ap2 comes with a clock on its cluster, but missing the glorious 9k redline that I bought this car for. After many searches around s2ki, I came across pictures of the UK-SPEC S2k. The UK-spec S2000 retained the F20c, through all its model years, even after their “ap2” facelift. The cluster on that car has a clock, check, it has a 9k redline, check, MPH on the speedometer (they use MPH not KPH for speed), check, just what I wanted. My first task was to track down an UK ap2 cluster. I was in luck when I found one on clubrsx for 200 shipped. I paid the member, and after a month of him saying he was “out-of-town”, saying he was going to “ship it out tomorrow”, I finally filed a PayPal complaint. I got my money back from PayPal. Surprisingly, he PM’ed me and told me he was really out-of-town and just sent it to me. I received it a week later, and paid him. I knew the Ap2 cluster has two plugs while the Ap1 cluster has four plugs, and after finding a wiring diagram, it was just a simple task of rewiring the plugs. I sourced an entire ap2 harness from S2ki. I then tried to remove the entire wiring harness from my car and replace it with this one, unfortunately they are not the same. If I wanted to really swap harnesses, I would have to swap both the dash harnesses. I wasn’t in the mood of buying another harness and removing the dash, so I just spliced it in. In retrospect, it would have been better for me if I just repinned the connectors, but then again I’m horrible at repinning. I always end up breaking the connectors. With the Ap2 cluster connector in back in, I plugged my cluster in. It fired up and worked fine, unfortunately the Engine Coolant Temperature gauge didn’t work. I spliced and soldered it about 5 times, before realizing that there is nothing wrong with the wiring. After doing research, I realized that I had an 06+ cluster (because I have the temperature gauge) and it doesn’t read the ECT the same way as an 00-05. The ECT on an 06+ cluster reads from the CAN-BUS. I had a gauge that would read everything but ECT. Of course, I need to know if my car is warmed up or not, so I went back on my search. I posted a post in the UK forum on S2ki wanting a 04-05 UKDM cluster, eventually a member PM’ed me and told me he could help me out. I said okay and paid him a decent sum for this cluster. It came in a couple of weeks later from England. Initially, it looked good, but after a further investigation, I noticed some fine cracks in the screen. I PM’ed the member back telling him to pay for the damages or to send me a new cluster. He said he was just the middle man, and couldn’t do it. I said whatever and just installed it. Mechanically, it worked great, everything worked, RPM, Speed, and of course the ECT. Over the next couple of weeks, my cluster would start to act funny, the ECT gauge would work on and off and my SRS light would show up. Eventually I chased this down to a ground I didn’t tighten all the way when I installed the cluster. I finally got around to ordering a new cluster face from England a couple of weeks ago, this wasn’t cheap. It was around half the price of what I paid for cluster itself. I could have saved some money if I didn’t buy it from LING’s Honda, a dealer from the UK and bought it from a member on the forum. I didn’t want to deal with anything going wrong so I just sucked it up. I installed my new cluster face into my cluster last week, it looks brand new. Things never seem to go the way I want them to, especially when it comes to my car. I don’t ever plan on selling this cluster in case I get a stack cluster in the future. I hope this can help someone out. Sorry for the crappy picture, I will have a DSLR one day again!